Ofcom recently revealed plans to make BT - with nearly 80% of the UK market - cut line rental costs by £5. "Older consumers are particularly affected, as they are more likely to be dependent on fixed voice services if they do not have a mobile phone or an internet connection," the report said. Ofcom also said it was "concerned" BT's low cost option for landline-only customers on certain qualifying benefits - BT Basic Tariff - had not been taken up by many of the households that could apply for it. The service costs £5.10 per month and provides customers with line rental and calls worth £1.50, with free calls at weekends to 0845 and 0870 numbers (up to 60 minutes). "We... are working with BT, the Department for Work and Pensions and other organisations to raise awareness," Ofcom said. 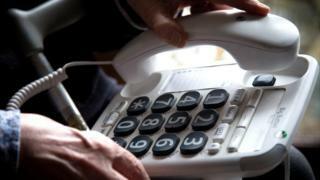 In a statement, BT said it had recently frozen line rental costs for customers with a phone line. The firm added that customers had enjoyed changes including "a faster fault repair service, the launch of our free nuisance calls prevention service BT Call Protect and bringing call centre work back from India to the UK". One in five people with disabilities is still without such access, however, making them "much more likely than the population as a whole to face exclusion issues as a result of not being online". "Life costs more if you are disabled," said James Taylor at disability charity Scope, who called for more to be done to get people with disabilities online. "The internet provides access to tools to compare prices, access to the best deals and offers, and information which can help disabled people be savvier shoppers," added Mr Taylor. "Every time there's an update of an operating system or something like that - that's a struggle for everybody - but if you're new to using a computer or tablet, you can be thrown when things change," Ms West told the BBC.